A high-frequency PCB can meet your needs when incorporating a special signal requirement into your electronic components and products. It offers a frequency range of 500MHz - 2GHz, making it ideally suited for high-speed designs, as well as radio frequency (RF), microwave and mobile applications. These higher transmission frequencies can also provide the faster signal flow rates that are a necessity in today's increasingly complex electronic switches and other components. Special materials are required to achieve the high frequency provided by this type of printed circuit board - any changes in the Er value of these materials can affect the impedance of the board. Many PCB designers turn to Rogers dielectric material for its lower dielectric loss, reduced signal loss, lower cost of circuit fabrication and better suitability for fast-turnaround prototyping applications. Apart from choosing the appropriate PCB material and determining the correct the value of the Er, designers should take parameter such as conductor width and spacing, substrate constant into consideration. These parameters must be exactly specified and implemented with the highest level of process control. PCBCart is an experienced full service PCB manufacturer who provides a reliable, superior-performing high-frequency PCB fabrication services. 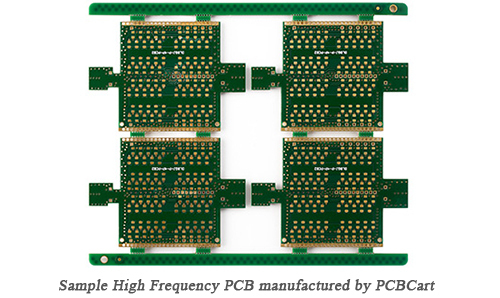 We manufacture high-frequency PCBs with frequency typically in the range from 500MHz to 2GHz. The following table shows some of our common-use materials for High-Frequency PCBs manufacturing. For High Frequency PCB manufacturing price, please send your PCB file (Gerber format preferred | Preorder Checklist) & requirements using our Advanced PCB Order System, we'll quote at quickest speed. Wanna know our customizable high-frequency PCB solutions? Can't determine which PCB material is the best choice for your project? Require advanced specs which are not listed in the above table? Reach our engineers for practical solutions.